Working from home is getting more popular. 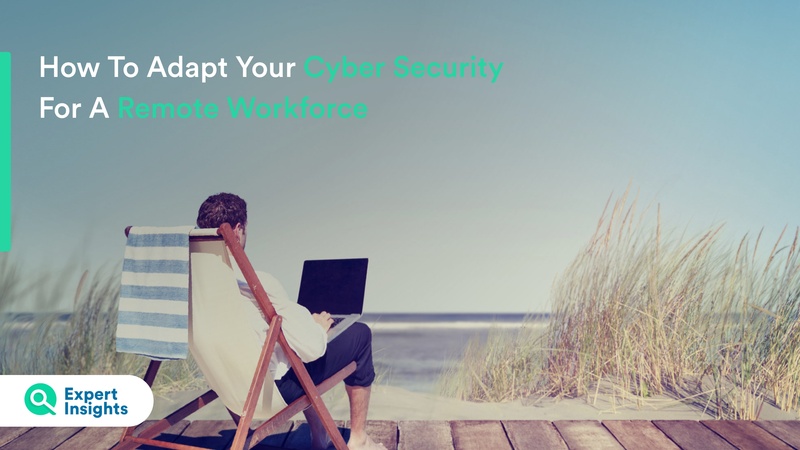 How can you protect your organisation and employees from cyber threats remotely? A growing trend in business is working from home. 3.7 million people work from home more than half of the time in the United States, and it’s not hard to explain why. It can make life much easier for employees and gives business access to a much wider pool of talent. But with the remote working only growing more popular, businesses face challenges with their network security. To have multiple people regularly accessing company data on their home networks greatly increases the risk of data loss. In addition, many people working from home are using their own devices. ‘Bring your own device’ (BYOD) has skyrocketed in popularity. Almost 60% of businesses allow people to use their personal devices for work. This adds another level of security problems and makes it difficult to ensure people are following company policies. What security problems can working from home cause? Working from home is much less secure than working from the office. Often, personal networks are not as secure as work networks. Taking work laptops home increases the risk of theft, which puts sensitive data at risk. People working from home may often go to coffee shops or other public areas to work. This too can a be a security concern. Publicly available Wi-Fi networks such as the one at your local Starbucks are often very easy for attackers to hack. This can mean that company information could be at risk. People using their own devices to work at home is also problematic from a security standpoint. Personal devices may not even have an anti-virus program, a far cry from the security that an office device would be equipped with. So, how can employees work from home securely? There is a range of security platforms available that can help your employees work from home securely. Here’s a quick overview of the services you should implement to improve your remote working security. DNS Web Protection platforms are cloud-based services which provide content filtering and anti-virus protection. Based in the cloud, these products are crucial to protecting remote workers. They are easy to install on a work laptop and provide protection on any network. This is ideal for working from home. DNS Web Protection services offer reporting capabilities. This allows you to ensure that everyone is browsing the web safely and in line with company policy during work hours. Some platforms offer policies which filter web behavior during work hours, but not afterwards. This allows users to use work devices for personal tasks, such as shopping or streaming media, while still offering protection. You can read reviews of the top DNS Web Protection services here. In an office, an Email Secure Gateway is standard. These platforms block spam and malicious emails from making their way into people’s inboxes. This is still hugely important to protect remote workers. If you’re using Office 365, there’s a range of Email Secure Gateways that protect employees working from home. Emails come from the internet and are then scanned by the Email Gateway. If deemed safe, the email then passes through the Office 365 servers, into the inbox of users. It doesn’t matter if the recipient accesses this at home, or in the office, they are still protected. The gateway also scans outgoing emails to ensure that if an account is compromised no malicious emails can be sent. You can read reviews of the top Email Secure Gateways here. This is important for all employees to have, but doubly so for those working from home. These platforms manage difficult to guess passwords for you. This ensures that all accounts are safe. It stops employees using the same, or easily guessable passwords, for multiple accounts. This is important for people working remotely because it ensures that they follow the company password policy. Many good Password Managers also allow administrators to set policies which mean passwords have to be a certain length and updated after a certain amount of time. These platforms also offer easy ways to share passwords to accounts, which is great if you need to collaborate on projects with your team when working remotely. We’ve put together an easy to digest guide on the best Business Password Managers which you can read here. Security Awareness Training platforms test your skills at spotting malicious emails. They send out false phishing attempts, to see where people need more security training and awareness. They then provide training for the people who need it, so that they can be better protected against real threats. You can find reviews of all the top Security Awareness Training platforms here. If you work with a lot of people working from home, chances are you’ll be sending a lot of emails. These will likely contain sensitive company information, which needs to be protected. Email Encryption platforms are a great way of doing this. Sending internal emails where both the sender and receiver use the same encryption service is really easy to do. Both parties will need to verify their identity before getting access, but the email is readable within Outlook. This means that even in the event of a remote workers device being stolen or lost, email communications and attached documents stay safe. These platforms also give admins visibility into where remote workers are sending encrypted emails. This reduces the risk of employees sharing restricted content without permission. Read our reviews of the top Email Encryption services here. Using these five products can really help to increase your organisation’s security for employees working from home. If you represent a small business, many vendors may offer an Essentials package, which bundles some of these platforms together. You can find reviews of all of the top cloud services for business here.